EDITOR’S NOTE: Wisteria Southern Gastropub in Morganton is now closed. One never knows what ingredient might alight on the threshold of Morganton’s Wisteria Southern Gastropub, though diners are guaranteed that, in most cases, it will be only hours removed from the earth, and usually from within 50 miles of the restaurant. Wild ramps, local shiitake mushrooms, baby beets, and bunches of sumac or foraged bushels of nettles — regardless of what arrives bagged and bundled at the back kitchen door, Chef Obie Ferguson thoughtfully considers each ingredient’s place on his menu, just as he has thoughtfully assembled his sustainable farm-to-table restaurant in the historic downtown corridor of this Foothills city. • • •Morganton is not Ferguson’s hometown — he grew up in Georgia, Athens and Atlanta, mostly. As a young adult, he spent some time in Italy — namely Sicily, Naples, and the Parma region — visiting his mother and stepfather, who moved there about the time he was finishing high school. Ferguson moved to Morganton in 2011 at the behest of his mother and business partner, Lisa Kennedy. She was in search of a place to relocate after her husband lost his battle against cancer. For years, Kennedy had talked about helping her son open a restaurant, and she was set on making it a reality. “I had always wanted to live in the mountains, so I jumped on the opportunity,” says Ferguson, who’d spent more than a decade working in kitchens throughout the Southeast. “I immediately bought a house.” His now-fiancée agreed to make the move as well. 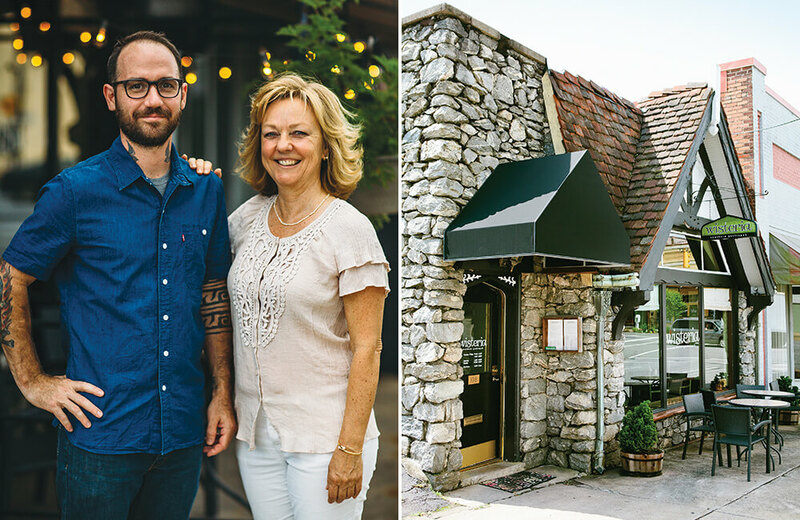 The Foothills have proven to be an ideal spot for Ferguson’s New Southern cuisine. Morganton brushes up against the Blue Ridge Mountains and is within commuting distance to nearby Hickory. The plentiful farms surrounding the city proper are a natural backdrop for a farm-to-table restaurant. Wisteria’s early offerings included Ferguson’s spin on staples such as pimento cheese, deviled eggs, and macaroni and cheese. He also committed to serving North Carolina brews rather than standard domestics. “I knew that I wanted to start making everything in-house,” Ferguson says, “and I wanted a place to teach myself how to cook” — that is, to build on what he’d learned from years spent in other people’s kitchens. • • •These days, Ferguson serves up pickled vegetable plates, with local vegetables pickled in his own house-made vinegar, and charcuterie boards, filled with North Carolina cheeses and a variety of cold meats (from local headcheese to a salami cotto, seasoned with sumac that Ferguson foraged while hiking with a friend). The land invites a limitless number of ingredients to be incorporated into Wisteria’s menus. Boiled peanut hummus is served alongside sweet potato home fries, a light and savory combination to begin a meal if one wants to snack on more than cornbread before the main course. Another menu item that makes repeat appearances at Wisteria is kielbasa: Sometimes, the sausage is stuffed with cornbread, braised in Cheerwine, and served with a Hakurei turnip puree over lightly roasted baby Brussels sprout leaves, or sometimes okra. 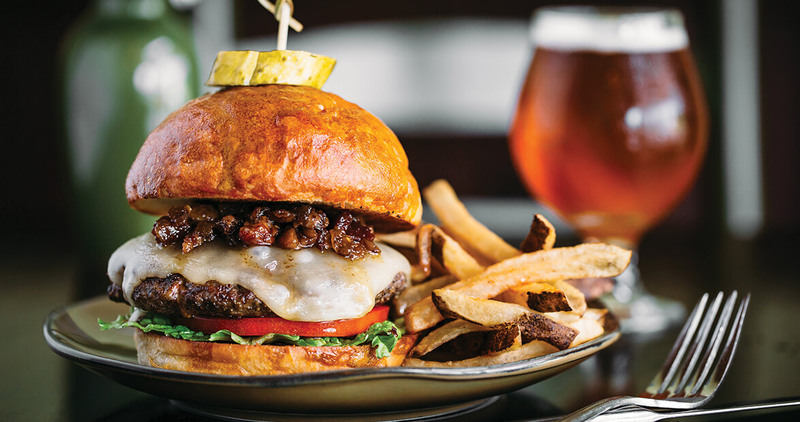 The most popular plate within the wood-paneled, street-level dining room (as well as the basement-level bar, or “pub” area) is Wisteria’s burger, made with local, grass-fed beef from Russell Family Farms in Morganton. Add bacon marmalade, a slice of Cheddar cheese, and a house-made bun — a specialty of Ferguson’s (he got his start in breads and pastries). Libations from the bar are as inspired as the weekly menu, though one is advised to inquire about what might be brewing rather than rely on the cocktail menu. Simple syrups and drinking vinegars — all from the same “mother” that Ferguson started with when he opened the restaurant — are identified with handwritten labels. Behind the bar are a variety of seasonal infusions-in-progress in Mason jars. • • •Like many Southern mothers, Kennedy would like to say her son learned to cook from her. But, she confesses, that’s probably not entirely true. “I never got my food from the grocery store. We shopped at a local food co-op in Atlanta,” she recalls. Her children said they didn’t like goat’s milk, which she bought raw, so she tricked them by filling store-bought milk containers with the homespun replacement. Still, Kennedy says, Ferguson’s talents in the kitchen are well beyond anything she can stake claim to. Named after a paternal great-grandfather who was Cherokee Indian, Ferguson has forged his own path in bringing sustainable food to Morganton, relying on the wisdom of well-known chefs such as Sean Brock, as well as cooking lessons with his own far-flung family: Kennedy’s extended family based in northern Italy taught Ferguson to make pasta, and now a fresh, house-made pasta dish is offered on every weekly menu. Each week, between eight and 12 local farmers are featured on a large chalkboard that hangs next to the bar. And little goes to waste when it arrives in Wisteria’s kitchen. When rainy weather brings fresh mushrooms to the door, Ferguson and his sous chefs might slice and incorporate the “pretty” top parts into a pasta dish. Then the kitchen will dry the stems and create a mushroom powder, which might be incorporated into the pasta dough itself, or mixed up in a salami or some other item for the charcuterie. Spices and flavors from the garden make their way into all of the restaurant’s breads, which are made fresh daily. • • •Just as the land invites a limitless number of ingredients to be incorporated into Wisteria’s menus, the restaurant continues to grow in new and interesting ways. Ferguson is getting ready to roll out a food truck that will be parked in front of local breweries like Fonta Flora, which is located a few blocks up the road from Wisteria and serves field-style and foraged farm beers.